Description: A fan-tastic, energy efficient decorating idea for a home, retailer or hospitality location, Meyda's Award-winning Chandel-Air? 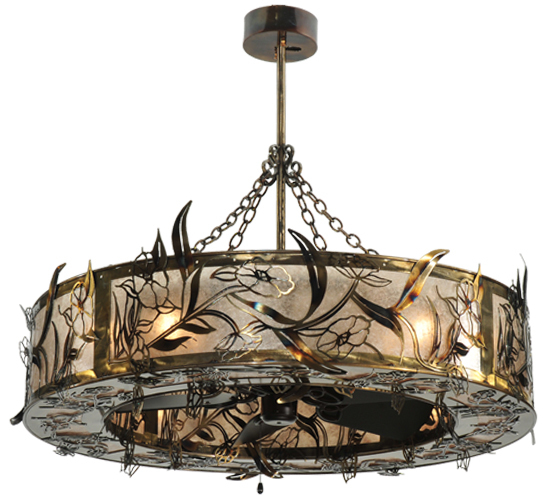 combines a ceiling fan with lighting technology that features a warm Silver Mica shade, Lady Slipper accents and hardware hand finished in Light Burnished Brass.The fan blades are offered in an Oiled Bronze finish. Handcrafted in Yorkville, New York by highly skilled Meyda artisans.This energy saving Chandel-Air? can be used to pull hot air up and keep the space cool in the summer and reversed in the winter to push down hot air and maintain warmth.Energy efficient lamping options available. UL listed for damp locations.